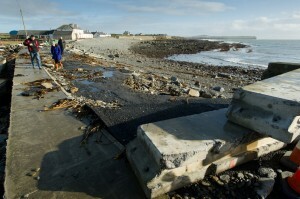 A view of the general destruction caused at Spanish Point following the latest high seas and gales. Photograph by John Kelly. AS Clare County Council tots up the massive bill for the combined damaged caused by storms Christine and Bridget, Met Éireann has forecast worse if still to come in terms of flooding. The main road in Kilbaha village covered by rocks, undermined in places and cut off following the latest high seas and gales at Kilbaha. Photograph by John Kelly. The local authority says most areas affected by severe weather in early January were again affected by the weekend storm with further structural damage reported along Clare’s Atlantic coastline and at some locations along the Shannon Estuary. Some remedial flood defence works carried out in recent weeks have been significantly undone in places as a result of the weekend weather, including at The Flaggy Shore, Seafield, and Kilbaha. Lahinch promenade remains closed to the public until further notice after the walkways and seawall suffered further damage at the weekend. 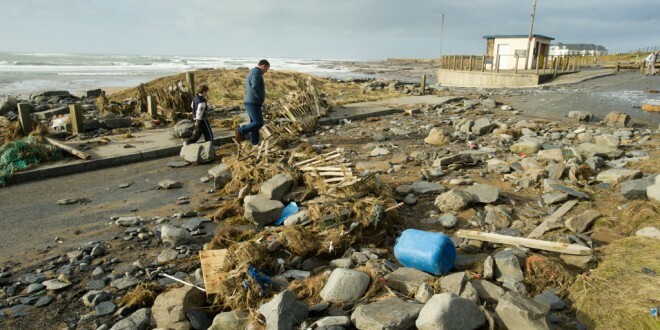 A number of other locations, which were not significantly affected by previous storms, have suffered infrastructural damage and flooding including Kilkee, Spanish Point and Moyasta. The focus is on the cleanup of storm affected areas in addition to remedial works to local authority-managed public infrastructure damaged in this and previous weather events. 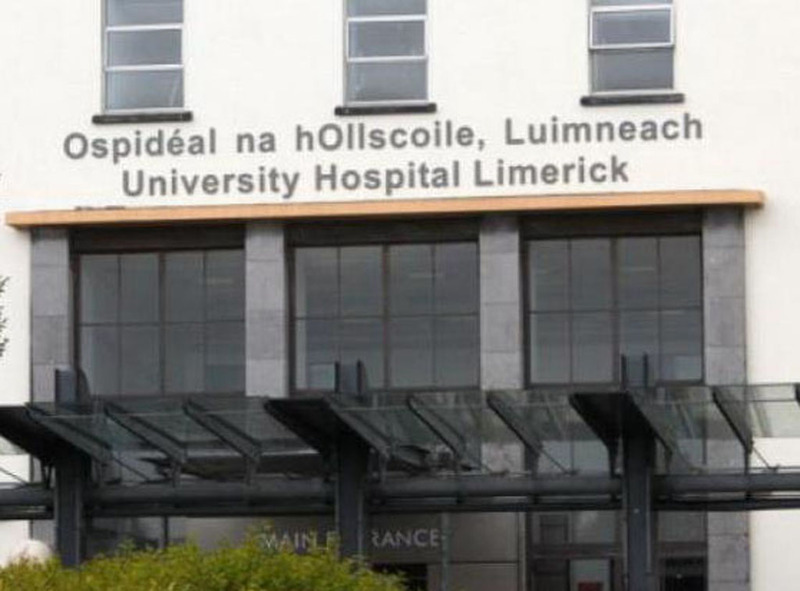 It also expects to revise upwards the original €23.7m cost of repairing damaged infrastructure, which was contained in its report to the Government last month. A revised report will be issued to Government later this week. Senior Engineer, Tom Tiernan said the risk posed by tidal flooding along the Atlantic coast and Shannon Estuary has “abated to some degree during the past 36 hours”, but he urged land, home and business owners in flood prone locations to remain vigilant. He added that the primary focus of concern over the coming days is likely to switch from coastal areas to inland locations where forecasted heavy rain is expected to lead to a further rise in already high water levels, including on the River Fergus and the lower Shannon River. 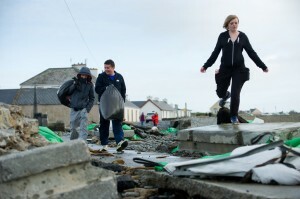 Locals negotiates their way through the trail of destruction on the main road in Kilbaha village which is cut off to traffic following the latest high seas and gales. Photograph by John Kelly. “Based on the information we have received from Met Éireann, our primary concern at this point is that localised flooding is likely to occur during the next week as further heavy rain will lead to increases in already very high river levels. 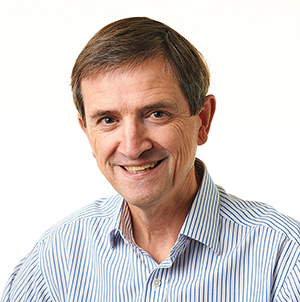 Council engineers are continuously monitoring river levels, and contingency arrangements in terms of additional pumping capacity and other flood alleviation measures are in place at flood prone locations,” he added. 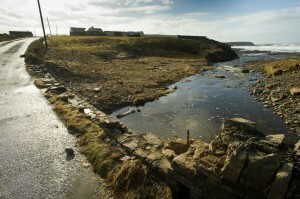 A view of some of the destruction caused by the latest high seas and gales at Cladagh, Miltown Malbay. Photograph by John Kelly.